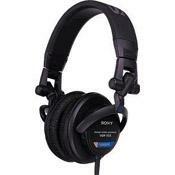 The MDR-7505 is a compact, sealed-ear, professional stereo headphone, designed for professional DJ and studio use. Gold Connectors and OFC Cord. For professional DJ and studio use.